New promise is on the horizon for higher education as Generation Z students take center stage to accept their high school diplomas. This generation of young adults is perhaps the most determined of them all. They have big plans for the future of America, and your university is the next stepping-stone on their journey to the top. Did you know only 65 percent of Generation Z believes the benefits of a college degree outweigh the cost? This is a wake-up call and an opportunity for universities to boost enrollment and retention rates, and improve the overall health of their institution. But to capitalize, they must understand what Generation Z is looking to get out of their higher education experience. Today’s students don’t know a world without smartphones, texting or high-speed Internet. They grew up with technology and are the most digitally fluent generation ever to climb the ranks. As a result, they want technology to be a part of their everyday life, and may choose a college that aligns with these desires. University presidents recognize this and are just beginning to push for greater technology, especially that which increases student engagement with their school. They believe critics are focusing too much on cutting costs and not enough on technology.1 Perhaps as a direct result, 63 percent of administrators are making technology spending a priority.2 In fact, 68 percent of private and 66 percent of public four-year institutions are transforming their campuses. 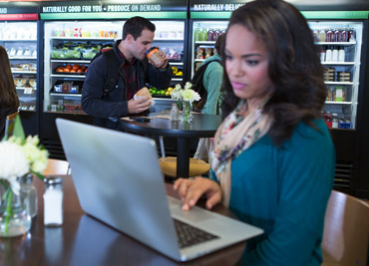 Here’s how technology can be integrated into your dining and facilities services to attract and retain students, lower operational costs and maximize resources. Here are just a few ways universities can integrate technology into their dining program to address these wants. Self-serve kiosks allow students to interact with a touchscreen display to quickly and easily view menu options, including photos and descriptions of each item. Kiosks support hundreds of made-to-order recipes. The menu can be quickly and easily changed or customized by foodservice staff. Students can view nutritional information to ensure their selection meets their dietary needs or preferences. And completed orders can either be displayed on a digital monitor or sent via text message to the student. And online ordering through an app gives students the ability to order and pick up food at their convenience. This option is especially helpful for students who have little time to spare between classes or meetings. They can order same-day or in advance, select a pickup time, bookmark their favorite meals and avoid waiting in line. Most advantageous for the institution, these applications can provide students with a review feature to provide feedback about each meal. With self-serve kiosks and online ordering in place, dining venues run more efficiently with less food waste. Integrated reporting tools and student reviews via mobile applications help dining service staff better understand which menu options are performing well and which aren't so they can more accurately stock food inventory and delight students. Wait times are dramatically reduced or eliminated and more students can be served per day with greater customization and concern for their specific wants and needs. Furthermore, mobile applications actually engage and involve students in the meal program. Ivy-covered halls, rich greens and blossoming trees are beautiful, but students today expect far more than aesthetic appeal on campus. They want to see unique learning spaces, security, cleanliness and comfort. And they expect campuses to be running at the highest efficiencies to achieve these standards. Security is at the top of the priority list for students and parents. If students don’t feel safe, enrollment and retention rates will suffer. To protect students, faculty and staff, universities are equipping their campuses with mass notification systems that broadcast warnings to mobile phones, electronic bulletin boards, email accounts and social media. They’re also outfitting all campus buildings with keycard access only. Some of the safest universities in the country also have adopted high-definition video surveillance imaging technologies, and eye, hand and finger biometrics scanners. Another way universities are using technology to create an inimitable student experience is by developing unique learning spaces, like makerspaces. Makerspaces are facilities that provide technology, manufacturing equipment and other resources for student use. Students can gather in these facilities to work on projects, share knowledge, network and, ultimately, create and invent. Tech-savvy students are drawn to these spaces as they align with their entrepreneurial spirits. As young people create startup companies every day, makerspaces allow for a creative outlet where students can potentially begin a company that will one day change the world. The ability to connect most anything to the Internet is one of the fastest growing areas of technology, and the facilities industry is embracing this smart technology. Facilities personnel can now virtually monitor the physical condition of an entire campus. Buildings can relay information on their performance, condition and environment real-time to managers and technicians. Environmental sensors, energy meters and building automation systems are just some of the tools that allow a facilities organization to efficiently and effectively manage campus buildings, mechanical systems, and even custodial equipment. The technology helps facility management quickly process service requests, monitor and optimize utility consumption, and schedule assets to improve the quality of each learning space. Imagine your facilities staff being able to quickly diagnose a mechanical problem by reviewing a three-dimensional, virtual model of the space behind your walls. Building Information Modeling (BIM), long used in the design and construction industry, is now being embraced by facilities operations. It improves the facilities data collection process, creates reliable as-built drawings for maintenance, and improves planning and budgetary accuracy. Virtual models can be accessed by maintenance staff on wireless handheld technology without having to disrupt classes or guess where a problem lies. Ultimately, BIM for facilities management reduces an institution’s risk by removing the assumptions too often relied on during the planning and operations process and reduces the time for work order cycles. More aggressive marketing strategies and leveraging outdoor spaces for education purposes can be achieved using smart technologies. Thoughtful landscaping can become a powerful marketing tool by enhancing first impressions and engaging the campus community with outdoor educational and gathering spaces. By leveraging innovative Geographic Information System (GIS) technology, you now can capture, manage, analyze and display all areas of the campus, geographically referenced. Cutting-edge digital imaging software lets you visualize, question and interpret data to create a full inventory of the landscape and hardscape of the campus. Create incredibly detailed images, with 3-D editing for photo-realistic renderings. This brings new marketing opportunities, while imagining the future of the campus. Buildings between 25 and 50 years old average work orders of about $2.35 per square foot and typically have a maintenance backlog of about $110 per gross square foot.4 Facilities management software and BIM can help reduce this cost by providing greater insight and resolution capabilities. Students benefit from buildings that are better managed, as they are more comfortable, reliable and conducive to learning. Furthermore, facilities managers can maximize space and resources, lower the cost of operation and create an environmentally sustainable campus. Greater security and state-of-the-art technology rounds out the learning experience for students and creates an unparalleled environment for students to innovate and socialize. Using technology to improve the campus experience is a powerful way to improve the vitals of your institution. But more than 50 percent of administrators and financial officers are still concerned that technology is a cost driver.5 To help ensure they receive the greatest ROI from their technological integrations, many institutions are choosing to work with food and facilities service providers that specialize in custom-fitting institutions with technologies that specifically address pain points. There’s no arguing that technology impacts all areas of higher education. Those who embrace it and work toward transforming their campus to meet the demands of incoming generations are more likely to succeed.